It turns out his on air co-host, Lynne Miller, had been in for a tummy tuck, and he wanted to surprise her with a mobility scooter to help her get about on her first day back at work. 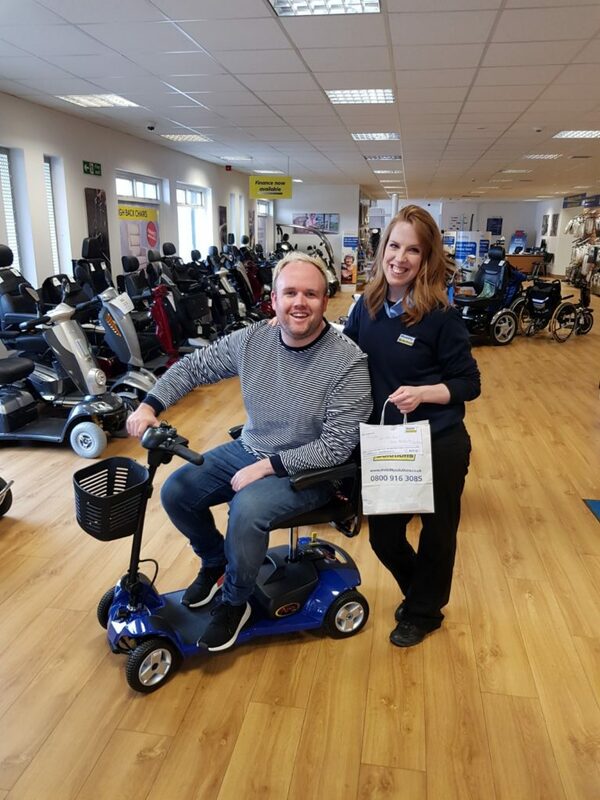 Paul came and collected one of our rental mobility scooters from our Glasgow superstore, where staff member Olivia had it ready and waiting for him, along with a bag of Mobility Solutions goodies! We snapped some pics and also helped Paul film a video, so he could share Lynne’s reaction with fans of the show on his social media channels. Although a bit surprised by her new mode of transport for the day, Lynne made the most of it and stepped straight on for a test drive. After a shift at the Heart radio studios, the scooter even took a trip home with Paul for a blast up and down his street before he brought it back to us the next day. If you’re in a similar situation and require a scooter for short term use, we have a range of mobility scooters available to hire in the area local to our Glasgow superstore. To find out more give us a call on the number at the top of this page or drop us an email to info@mobilitysolutions.co.uk.